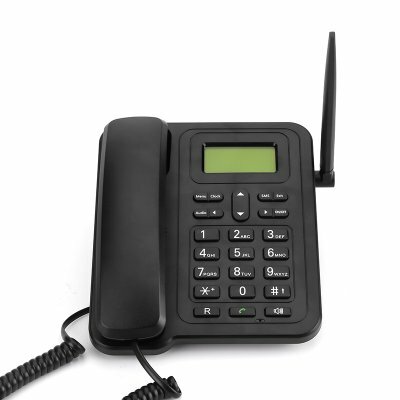 Successfully Added Fixed Wireless 3G Desk Phone - SMS Functionality, 1000mAh Removable Battery, 3G Network Connection to your Shopping Cart. No office is complete without a fixed wireless desk phone that allows you to effortlessly stay connected throughout the day to all your business and private contacts outside the office. With its practical and stylish large button design, this wireless phone is easy to use and operate – similar to any regular telephone out there. Its wireless plug and play design makes this 3G desk phone easy to use and works without needing any cables. No longer will there be the annoyance of an overload of cables stacked behind or below your desk as, with this 3G desk phone at your side, you’ll be able to stay connected to the outside world completely cable free. Featuring a powerful 1000mAh battery, this 3G desk phone comes along with countless hours of continuous usage time, letting you get through the most demanding of working days at the office without needing to worry about running out of juice. The battery of this wireless desk phone is removable and rechargeable, allowing you to efficiently recharge or replace your battery whenever deemed necessary. With its large memory, this high capacity 3G desk phone offers plenty of space for you to store all your contacts – assuring that you’ll be able to reach your business partners, friends, and family at any given moment. Added to that, this wireless desk phone also has SMS functionality, letting you conveniently send out and receive text messages on your 3G desk phone and so further increasing your overall user experience significantly. Besides being the perfect office phone, this 3G table phone is furthermore perfect to be used by the elderly and people with a mental of physical disability. Its easy design and large buttons make this 3G telephone extremely easy to operate, making it the perfect phone for those that can’t operate a regular mobile cell phone. From now on these people no longer have to deal with those tiny cell phones in their hands as, with this 3G desk phone, they will be able to stay connected at any time to family and loved ones while using a device that features the familiar and trusted design of a regular telephone. This Fixed Wireless 3G table Phone comes with a 12 months warranty, brought to you by the leader in electronic devices as well as wholesale electronic gadgets..
Arabic: - هاتف لاسلكي - Chinese Simplified: - 无线办公桌上的电话 - Czech: - Bezdrátový stolní telefon - Dutch: - Draadloze bureautelefoon - French: - Téléphone fixe sans fil - German: - WLAN auf dem Telefon - Hebrew: - טלפון אלחוטי דלפק - Hindi: - वायरलेस डेस्क फोन - Hungarian: - Vezeték nélküli asztali telefonok - Italian: - Telefono senza fili - Japanese: - ワイヤレス電話 - Korean: - 무선 데스크 전화 - Malay: - Telefon wayarles Meja - Norwegian Bokmål: - Trådløs bordtelefon - Romanian: - Telefon de birou fără fir - Russian: - Беспроводной телефон - Spanish: - Teléfono de escritorio inalámbrico - Thai: - โทรศัพท์ไร้สายโต๊ะ - Turkish: - Kablosuz masa telefonu - Vietnamese: - Điện thoại bàn không dây.